Now that our Mimobot has been given away, that just leaves one more goody to offer our loyal readers. 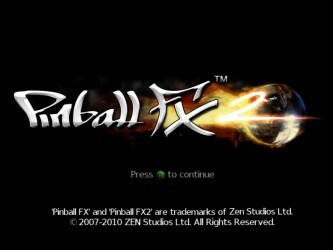 Back when we were rounding up the games for the XBLA Game Feast, Pinball FX 2 turned out to be a tricky little devil. There was a short delay, and while we were working out the details, we got in touch with both the developers and the PR folks. Both of them were super helpful, and when the game finally released, both PR and the developers sent us a code! Lucky for you, they are letting us pass one along, extending our giveaway series for another week. This time around you are playing for the title itself, the core tables, and some classic tables, too! We’re mixing it up a little bit this week. You’ll still be able to comment here for an entry, but instead of youtube, twitter will be your chance at a bonus entry. All you have to do is follow us and retweet the contest announcement. No more entries. Winner announced on Monday, Nov. 22nd. Did you already choose a winner and just forgot to update the page? I can’t wait to find out who won!